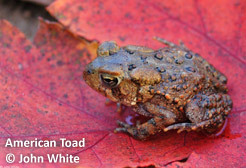 Teachers, please join us in raising awareness about Virginia’s frogs! Similarly, there are SOLs suited to this topic in the Resources strand, such as 3.10 “effects of human activity on water quality” and 4.8 “watersheds and water resources.” Certainly upper grade levels can benefit from outdoor learning in Life Science and Biology classes, too. There may also be opportunities to partner with local volunteer organizations that can work with you and your students to improve habitat for frogs and other amphibians on school property through DGIF’s Schoolyard Habitat program. For more information and lesson ideas, please visit the websites below. Schoolyard Habitats make wonderful outdoor classrooms where your students can observe and learn about frogs, birds, butterflies and many other wildlife species. Learn how to start one at your school by visiting the DGIF Schoolyard Habitat program webpage.